Today was Mr Tweedie’s birthday, so not an ideal day to begin the challenge, especially seeing as our friends were staying (including my co-blogger Julia! ), but nonetheless I got an hour of sewing done after their departure whilst Baba Tweedie was napping, and another hour done once both kids were in bed. But nevermind all that… what am I sewing? Well, I am making the Shirtwaist Dress from Gertie’s book, which was a birthday gift from Julia. I knew I wanted to make this dress, but I had been putting it off due to having to get to grips with a few new techniques. However, upon asking Julia what dress she’d like me to make for her 30th birthday (she made this beautiful dress for my 30th), she requested the Shirtwaist Dress, so I’m making one for myself first as a way of practising the techniques and construction before I make hers. I am a little apprehensive about making bound buttonholes and doing shirring, but it’s certainly good to be learning something new. In my two hours today I cut my fabric and transferred the markings. Despite having bought 3.5m of fabric, I didn’t have enough and will need to buy 80cm more in order to cut the final pattern piece – one of the skirt fronts. I am a tad annoyed about this – has anyone else who has made this dress had a similar issue? I have a feeling that this dress is going to be a time-consuming project, so I won’t have many photos to show you. 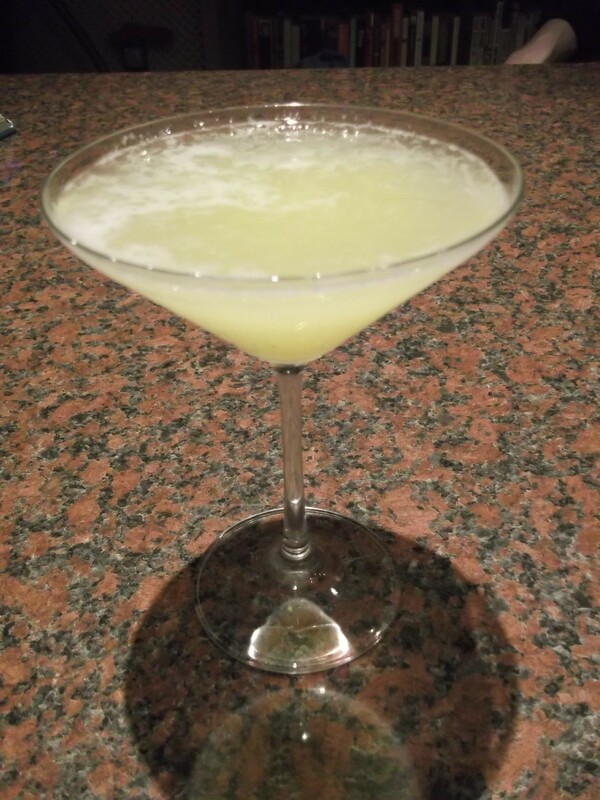 Therefore, I’m going to include photos of the cocktails I drink in the evenings, to make it more interesting! I recently restocked my cocktail cabinet, and I am working my way through this book, which I would highly recommend to anyone who does not already have a cocktail book. Even if you do, I bet it isn’t as good as this one! It is really comprehensive and not only includes cocktail recipes, but also the history of cocktails, information about the different spirits and liqueurs, recipes for snacks which complement different groups of cocktails, and tips on the art of mixing drinks. It’s brilliant! Wash and peel the ginger and cut the pineapple into small pieces. Crush them both with a pestle in the lower part of a cocktail shaker to obtain a puree. Add the ice, vodka and sugar cane syrup. Fit the upper part of the shaker and shake vigorously for 10 seconds. Strain the mixture into a martini glass and serve. A small test area of shirring! After watching The Great British Sewing Bee, I did my remaining hour and a half, working steadily through the pattern. I can already surmise that this pattern in not suitable for a beginner. The instructions are not quite as clear and explicit as some other patterns I am accustomed to. I am glad to have a bit of experience behind me, particularly of sewing shirts! 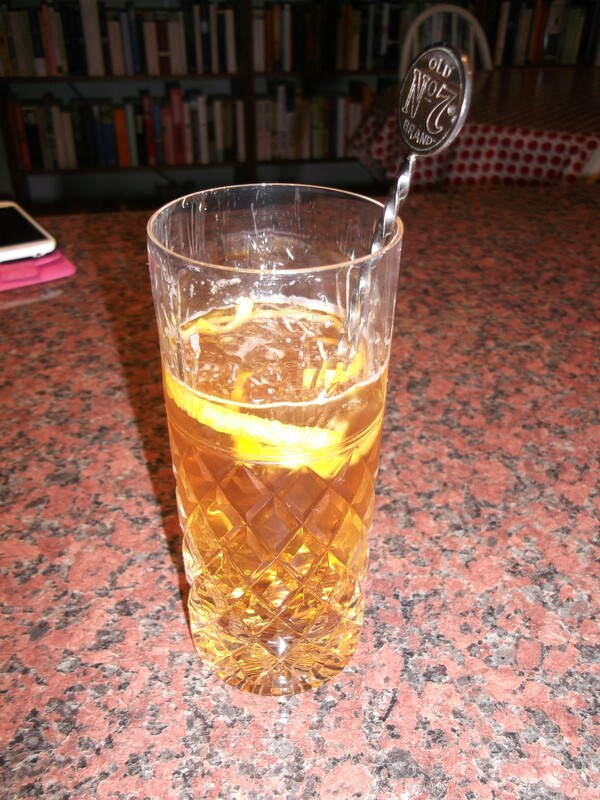 Using a paring knife, cut the entire peel (zest) from the lemon in one long spiral and place this in a highball glass. Add the ice and other ingredients, stir gently with a mixing spoon for 8 – 10 seconds and serve immediately. Today I got half an hour of sewing done whilst both children were napping, and the rest when they were in bed in the evening. 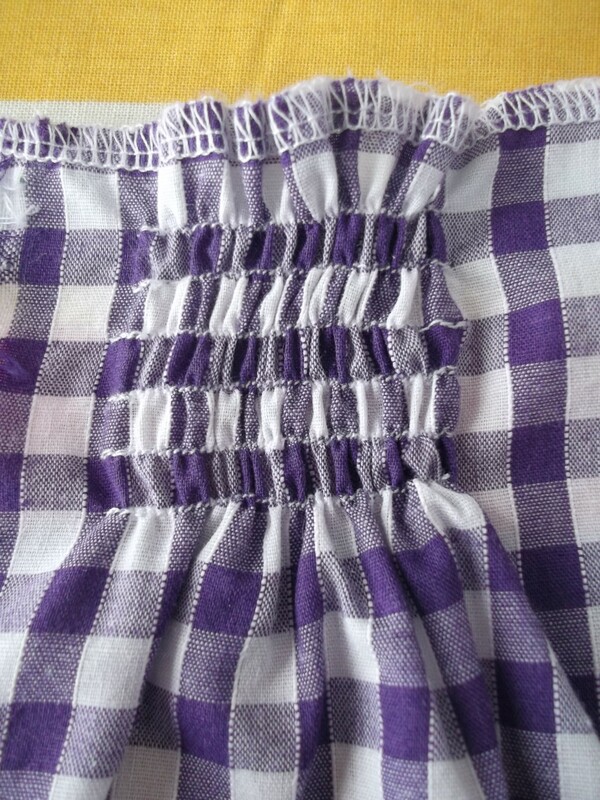 I used part of the time to have a go at making a bound buttonhole on a scrap of fabric, as I’ve never made one before! It took me rather a long time, and the result is definitely imperfect, but as Mr Tweedie pointed out, the buttonhole itself will be mainly obscured from view when fastened anyway! My first ever bound buttonhole! 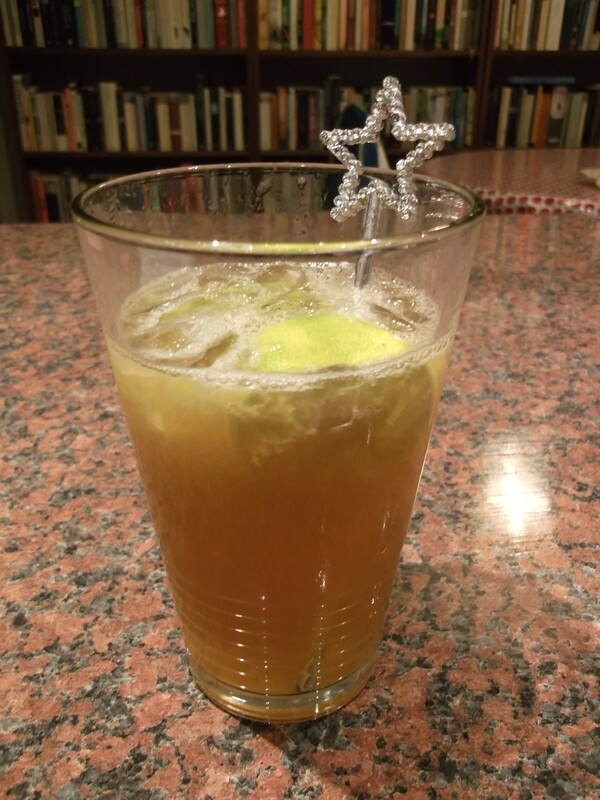 Place the ice, vodka, lime juice and Angostura bitters in a highball glass. Add the ginger beer and stir with a mixing spoon for 8 – 10 seconds. Add the slice of lime before serving. Today I needed a break from the Shirtwaist dress as I still hadn’t gotten round to buying the extra fabric I need for the last skirt front piece, so when Little Tweedie was at nursery and Baba Tweedie was napping, I traced out another Sew Serendipity Monique dress, this time in a large, and I pre-washed the fabric. That took about half an hour, after which time I had to stop again to feed Baba Tweedie. He seems determined to not let me sew for more than 30 minutes at a time during the day! We then went out to get more fabric for the Shirtwaist dress, and when we got back he stayed asleep for another half hour which was an unexpected bonus! In the evening I got a further twenty minutes done, at which point I realised my iron had broken!!! Mr Tweedie tried changing the fuse but to no avail. I could not proceed with the Shirtwaist dress without an iron, so instead I cut the fabric for my Monique dress, which fortunately had already dried and wasn’t too creased! I had three cocktails this evening, but forgot to take a photo of any of them! 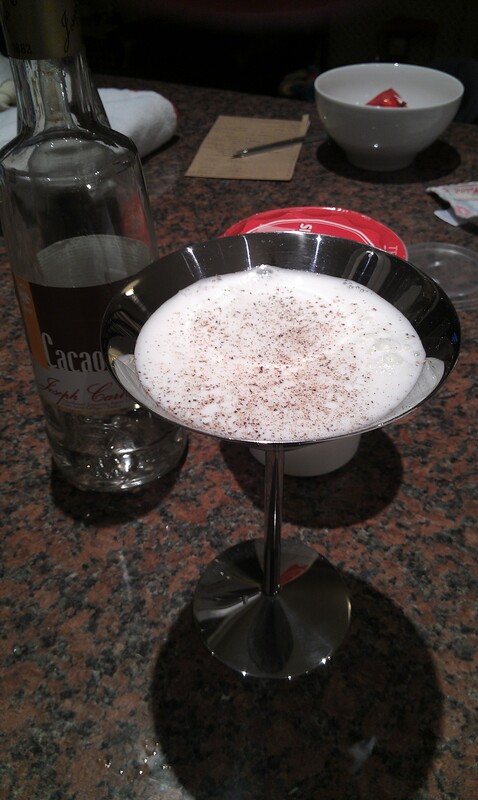 Place the ice, gin, crème de cacao and cream in the lower part of the shaker. Fit the upper part of the shaker and shake vigorously for 8 – 10 seconds. Strain into a martini glass and grate a pinch of nutmeg over the drink. Contrast fabric for my next Sew Serendipity Monique dress. I also transferred all the markings on all of the other pieces, so this dress is ready to sew up as a nice quick project after the Shirtwaist dress. (I still need to make Julia’s Shirtwaist of course, but I’m taking a break in between!). I then made 6 of the 8 bound buttonholes. I’m pleased with how they look, but they are ridiculously time consuming and unless I was making a coat or jacket, I don’t think I would bother again! My cocktail this evening was a Garibaldi. I’ve only recently tried Campari, and to be honest I think it tastes like poison. The orange juice in this cocktail obviously helps to dilute the taste, but really I’d rather have a Garibaldi biscuit than a Garibaldi cocktail! Place the ice and Campari in a highball glass. 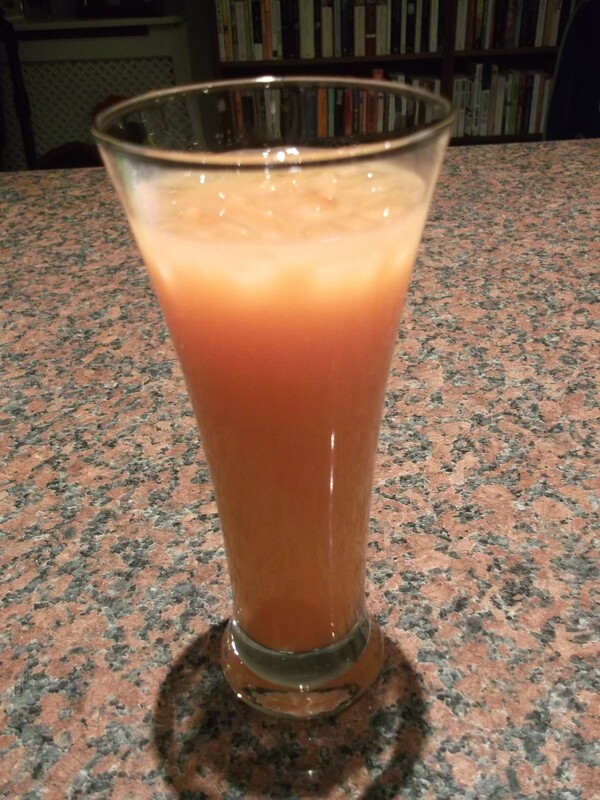 Slowly pour in the orange juice and serve immediately without stirring. I convinced Mr Tweedie to take the children out for another long walk today, so I did 1 1/2 hours of sewing whilst they were gone and another 1 1/2 hours when they had gone to bed. I finished the bound buttonholes, although I still have to make ‘windows’ in the facings. I attached the sleeves and I’m not sure I like them. In the picture in the book they look nowhere near as puffy as mine do, but I double checked the size of the pattern piece and the markings and I definitely cut them correctly. I’ve attached the collar which was the usual faff and my next job is to attach the inner yoke and the facings. I am getting there… hopefully I will finish this in the next few days! 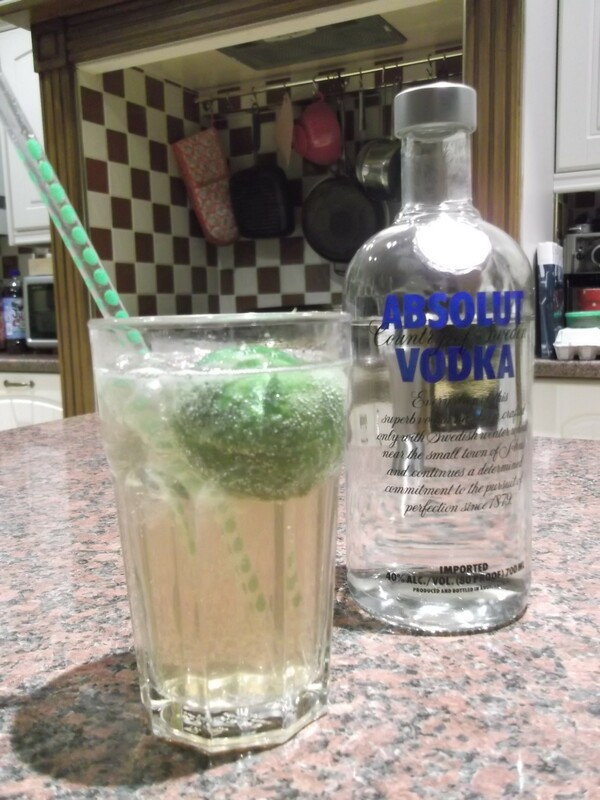 Cut the lime half into two quarters, place them in a highball glass and crush them with a pestle. Add the ice and the other ingredients to the glass. Stir with a mixing spoon for 8 – 10 seconds and serve. So there you have it – the first week of my April Challenge! 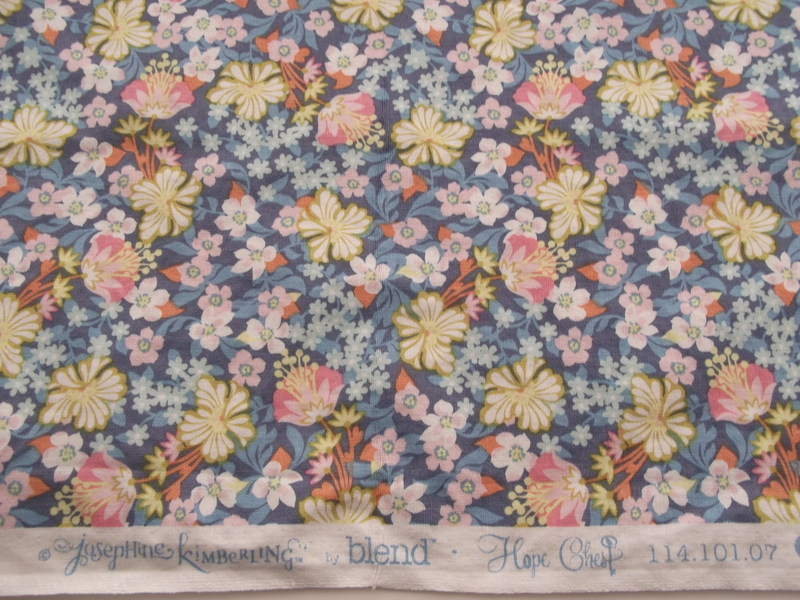 No finished projects to show you, but lots of cocktails drunk, a new iron purchased and some serious groundwork done for the Shirtwaist dress – all in all, a pretty successful start! I’ll be back next week. Until then, cheers! Your shirring looks great! I would kill to have two hours to sew every day, so I am super jealous. I love that you included cocktail recipes to drink while sewing. My hand-hemming usually involves a beer! Thanks. I usually drink after sewing! I don’t have two hours spare every day: I have to make the time and push myself to do it. It means sacrificing other things too, such as laundry, housework, watching tv, relaxing, reading, spending time with hubby etc. It is unsustainable in the long term, but just about manageable for one month! Love the cocktail recipes included with the gorgeous sewing – more cocktail in the evenings, I say!